A few years ago, when I was still working at the school and before I began blogging, one of my co-workers brought in plastic bags of Lilies of the Valley starts. She literally pulled them out of the ground and plopped them in bags. I brought a few starts home and planted them in a bed right outside my kitchen window. The next year they came up and I asked Charlene (my co-worker) if I could have some more. She gladly obliged and the second batch of starts was planted. This is what my little piece of Lily of the Valley heaven looks like now. This year (finally) I had enough blooms to cut and fill some small containers. I looked around and gathered three of my favorites. The little silver creamer you have seen before. The milk bottle is a treasured vintage piece. It’s from the San-A-Pure Dairy which was the dairy that provided milk to my town back in the day. I’m told the milk was delivered by horse and wagon right to your doorstep. Residents had a metal box that sat on their front porches and the delivery man would place the milk in those boxes. I have looked and looked for a box but have never found one. Maybe someday. The blue and white rooster was a bargain at my antique mall. 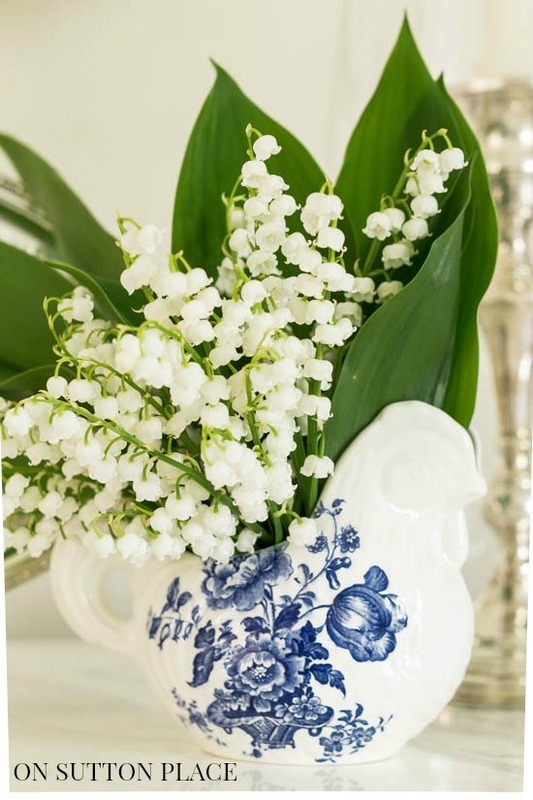 Small containers are perfect for Lilies of the Valley. I included some of the leaves just for stability but I’ve seen small arrangements done with just the blooms and they are equally as lovely. Lilies of the Vally have a scent like no other and it packs a punch. I put the milk bottle arrangement on my entry chest and could smell it from the living room. The day they are cut is, of course, when the scent is the strongest. I carried the milk bottle upstairs that first night and put in on my bedside table. It was such a treat yet so simple. 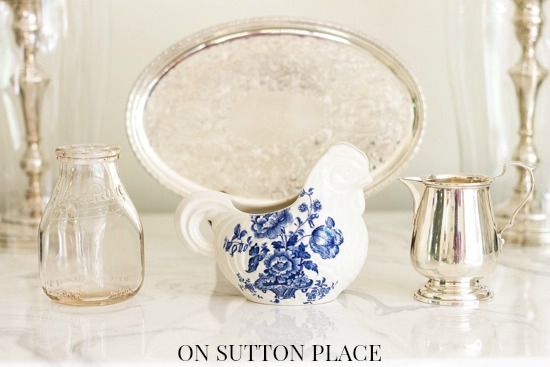 The little rooster landed in my kitchen with my other blue and white dishes. To arrange these delicate blooms I began with a few leaves. They act as sort of a stabilizer and add a great pop of green. I then added the blooms in small bunches until I had filled each container. Lilies of the Valley take no real care. Plant them in part-shade and let them go. I know some people think they are too invasive but if you have an empty spot they are the perfect choice. It takes a few years to get blooms so be patient. Let the foliage die down and cut them back in the fall. Like other hardy perennials, they need the foliage to die down completely to feed the plant for the next season. It’s important to know also that Lilies of the Valley are poisonous. Take extra care to wash your hands after handling and wash your containers well when the flowers are spent. I have never once looked at my patch of Lilies of the Valley and not thought of Charlene. Then when I think of her, I think of my old job and the school that I love. I miss it and miss the people. There are days when I would give anything to be back at my old desk…but I embraced this blogging adventure and the adventure isn’t over. Thanks to all of you, it’s just beginning. I’m happy you stopped by…I hope to be back before the long weekend but if I don’t make it please be safe and enjoy! They are such lovely little flowers. It’s a shame they don’t last long. I always cut a bunch to put in the guest bathroom – the fragrance is divine! Ann, I am just now getting to some old emails that aren’t spam! What a pleasant surprise to read your comments. Did I tell you they came from a few starts from Chris Mockensturm? I gave more away this year. I just tell people it takes a year or two to get a nice “batch”. I so agree with you about the fragrance. For such a little flower! I remember as a kid putting them in a “shot glass”. I still have the shot glasses from my mom.i have used them in recent years for just that. Memories! Thanks Ann for sharing your thoughts. I really appreciate them. God bless! I can hardly wait to cut and display some of these lovely treasures. Thank-you for sharing! Lily of the Valley is so lovely. A great idea picking them and bringing them inside. I am going to do that today for a Memorial day picnic!!! I love your blog….and the “adventurer” ! 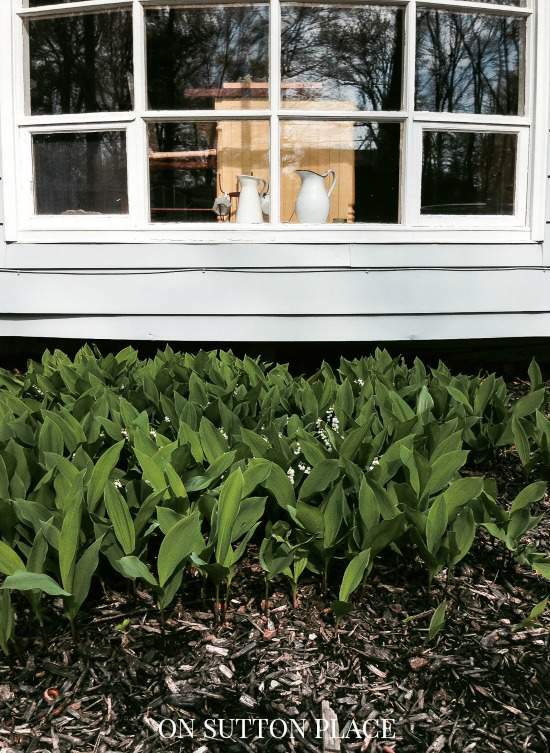 I have lilies of the valley growing in the front of my house. You’ve given me an idea – I think I may take some and plant them in the backyard. I’ve never thought to bring them inside, but I’m afraid the scent will make my husband’s allergies go crazy! Maybe I’ll try it and find out :) Lovely presentation as always, Ann! Such beautiful pictures Ann. We had a tons of Lilie’s of the Valley. I never got lucky enough to have blooms to cut and I love the smell. I didn’t plant them until later in our garden so we never were able to enjoy them. Love them on t hat tray. Ann, I love Lilies of the Valley. I wanted those for my wedding bouquet but was talked out of them (too expensive they said). That was 42 years ago and I still love the flowers. I’ve never thought to plant them though. Not sure how they’d handle the Texas heat. However, I love flowers that are perennials so I’ll investigate. Thanks for the lovely photos. Oh my gosh! Thank you so much for the C&E tip! Going to try and find some online right now! Hope this isn’t too late,… use Ebates for 5% cash back as of today and if you are a “member” of C&E there might be another discount. Happy to help. I love your lily of the valley bouquets. Mine are about to open up too and I will make a couple of bouquets to enjoy. Have a wonderful holiday weekend Ann! Hi Pamela! I just went to your blog and left a comment…but Google bounced the email for some reason. I don’t know if you got it or not…not sure if you will get this reply either but thought I would try. Let me know! I am totally jealous, Ann. That is one beautiful patch! Lily of the valley is one of my all-time favourites. Well mine lasted about 3 days which I thought was pretty good because the blooms are so tiny. The scent is strongest the first day and then fades as well. I guess we just have to be happy with a few days of bliss! I love lily of the valley. It looks beautiful with the silver! Those are precious. And now I have to run out and see if this is what my Mom-in-law put in with her tulips. I am trying to think if I saw white flowers last year. 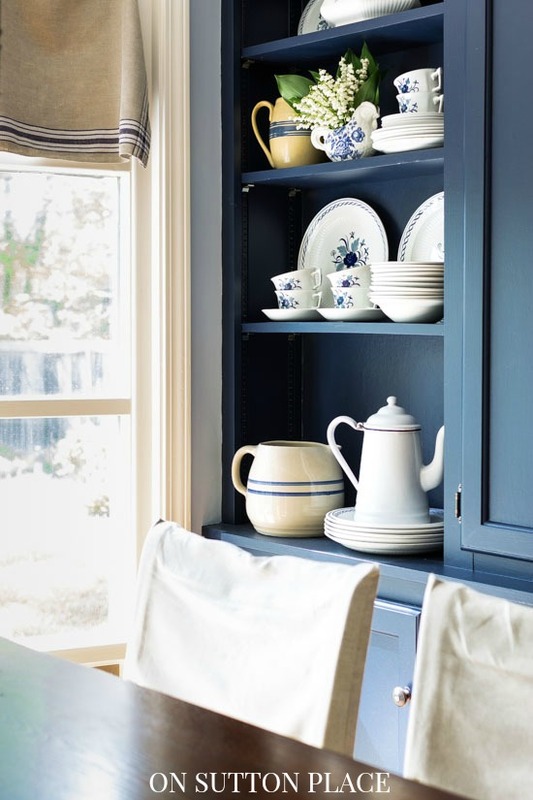 PS I love that cream colored stoneware pitcher with the blue stripes in your cupboard. You really have a beautiful bed of Lily of the Valley! They really don’t do well in our area. So enjoyed this & the pics are beautiful. My mom’s favorite flower was Lilies of the Valley. Do you think they would grow in Nevada? Hi Debra! Yes I do think they would grow in Nevada. Put them in partial shade and I think they would do fine. We had one of the worst winters ever here in Ohio and all my perennials came up just fine. Good luck! Mine came back stronger than ever this year. What I like about them is they are easy to pull up each spring so you can control the area. I have some starts right now in my kitchen waiting to give to some one. They make pretty green ground cover. I have never cut mine either. I love lilies of the valley. They look so beautiful. 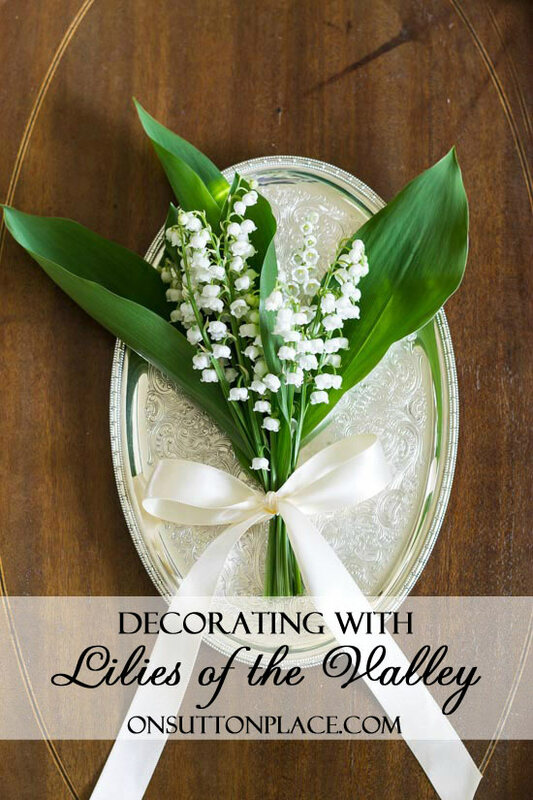 When I was a young girl, Lily of the Valley was the first corsage I ever wore. My aunt had them growing prolifically in her backyard, and making a corsage for Easter or Mother’s Day was always in order. They bring back so many sweet memories. I also favored Lily of the Valley cologne as a young lady. Wish I could find them now. Thanks for sharing the lovely photos. After reading all these lovely comments it appears that Lilies of the Valley bring back fond memories for almost everyone. I’m glad your memories are sweet! Crabtree & Evelyn has/had Lily of the Valley cologne. Spot on scent! Thank you Leelee…I’m so glad you stopped by! I have tons of these…I think they are volunteer plants from my neighbor’s yard. I never thought to cut them…I am definitely going to bring some in. keeping some leaves seems to be the right touch. 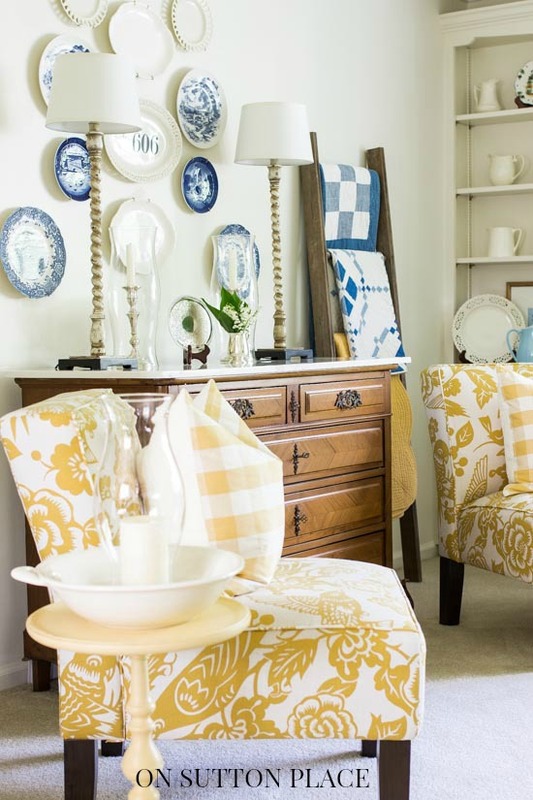 They looks so pretty in your home! Ann, lily of the valley are one of my favorites, too. An old neighbor had pink ones but I never got any from her. Did you know they are very poisonous? Just keep away from little ones and wash your hands after handling. Love your site. Thank you and yes I did know they are poisonous…although it just doesn’t seem right that something so pretty would be deadly! I will make sure and wash my containers in the dishwasher…except for the silver pitcher. I’ll clean that really well. 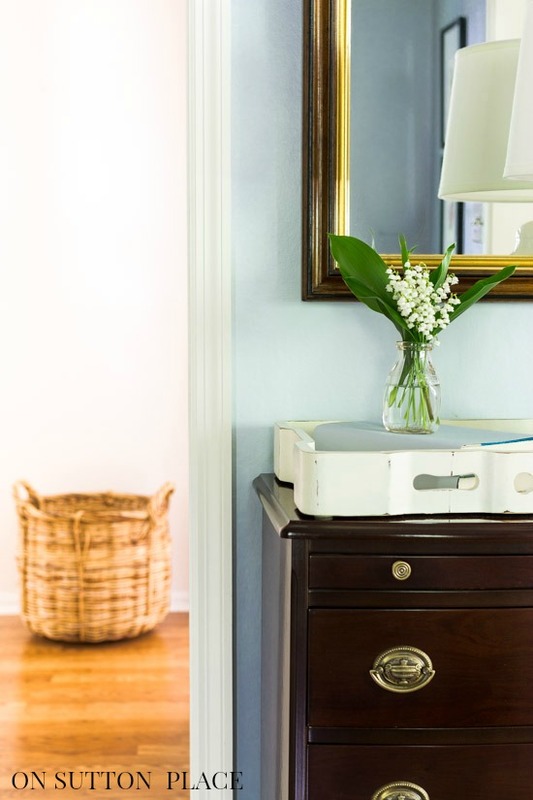 Love Lily of the Valley flowers.Love reading all your post and blogs .Any suggestions on Hyacinth Bean plant ? My husband ordered me the seeds and planted them in front of a white trellis and they are just starting to poke through the dirt.How do you train them to grow up the trellis? When is the best time to pull the pods come fall ? If you have any suggestions I would greatly appreciate it. I’m so sorry but I am going to be no help when it comes to your Hyacinth Bean plant…but if it’s a climbing plant it will curl around the trellis on its own. Just Google it and I’m sure loads of advice will pop up! Thank you for this post! I have these plants growing wild all over my front yard and for the past couple of years been rather annoyed with them taking over everything. However after reading your post and seeing their beauty through your eyes and your arrangements, I am going to pay attention to this plant! Thank you! I know…some people get so annoyed because they do tend to take over. Mine are in a spot that needed filled in anyway so I was happy when they multiplied! “Good things come to those who wait”, is so true! I adore Lilies of the Valley, and have a small bunch of them in my driveway bed. Thank you for reminding me to plant more. Your arrangements are lovely!!! Oh Deni I would give you starts if I could! Definitely plant some more! I love Lily of the Valley. They were in my Mother’s wedding bouquet. A number of years ago she had some in her yard which she shared with me. Mine are slowly spreading but I still don’t have enough to cut. One of these years I’ll have to find a small object to put mine in; looking forward to that time. Naturally when I walk by them, I am reminded of my sweet Mother. Beautiful Ann! Those containers are perfect. I’m sure your old job misses you but we gained a wonderful blogger and friend! Thanks for always inspiring us! They look lovely, just keep in mind that they are HIGHLY poisonous. I was told and also read in a Gardner’s magazine to wash your hands after touching them. Also, wash the items you displayed them in . Ann, today’s post is the best! You do a great job blogging, but I know you are also missed at school. Please keep this adventure going! I adore lily of the valley. My one little plant struggled then disappeared. I should try again. I think your arrangements are lovely and I always think the flowers look best displayed with their leaves. 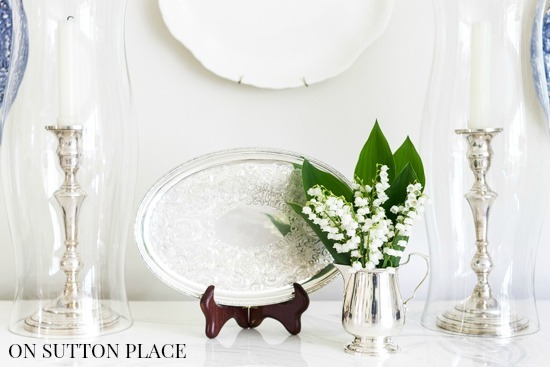 Love my Lilly of the Valley’s…and you’ve given me inspiration to go outside and pick a few bouquets and fill up some make shift vases to place them in every room! Very nice post. Your lily of the valley cuttings are simply beautiful! Those are gorgeous Ann. How nice they finally bloomed for you! I love these flowers, I like the idea of different vases. I love the containers you arranged the lily of the valley in. We have some growing on our front hill side. They are one of my favorite plants. Lilly of the Valley is my favorite flower. I had them for my wedding bouquet 23 years ago! And, I love your little milk bottle. I’ve never seen that size before. My grandfather started working for Borden’s, driving a horse drawn cart, when he was only 14 years old. When he retired, in the ’60’s, he was driving a semi. My parents’ side yard had lilies of the valley all along the foundation of their house. Lilac bushes and peonies, and a bush that I called orange blossom were in addition to the pear tree and grape arbor in our backyard. It was fun romping around our backyard as a child. Good memories. Thank you and enjoy your weekend. They’re beautiful, Ann! I just pulled a few yesterday for decorating with. I was lucky to have inherited them when we bought our house. If the windows are open & there’s a light breeze, I can smell them in the house…heavenly! I didn’t know they were that easy to transplant. Hmmmm….I may have to do some gardening this weekend!